The Nov. 4 midterm election brought new and repeat voters to the three polling locations within SF State proximity, who helped determine local and statewide races and propositions. 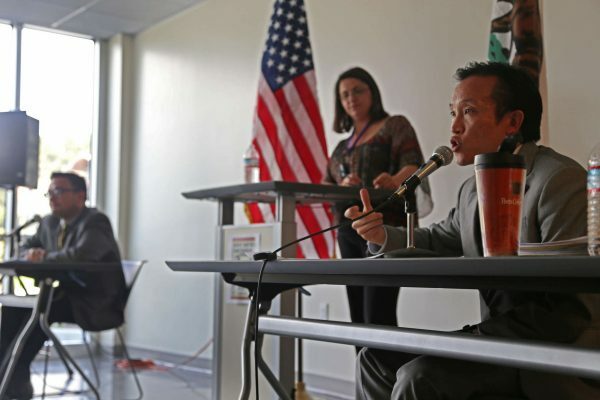 Some campaigns encountered heavy competition, including the District 17 State Assembly seat that pit supervisors David Chiu and David Campos against each other and resulted in a victory for Chiu. Incumbent Gov. Jerry Brown was approved for a fourth term after opponent Neel Kashkari conceded in the gubernatorial race shortly after polls closed. Some voter decisions fell on polar sides of the scale, with the overwhelming approval of Prop 1 to aid the state’s drought problems. The local measure to impose a sugary-beverage tax, however, just failed to secure a two-thirds vote. Below are selected unofficial projected results at press time provided by the City and County of San Francisco. Republican Neel Kashkari conceded to incumbent Jerry Brown, handing him a historic fourth term as the governor of California. Brown served two terms as governor during the late 1970s and early 1980s before winning the gubernatorial elections again in 2010. He captured more than half of the vote during the primary election, despite his limited media presence. Kashkari invested millions of his own money into his campaign according to the Secretary of State, but only received a 12.47 percent of state vote. San Francisco Supervisor David Chiu speaks during a debate with Supervisor David Campos at SF State’s J. Paul Leonard Library Wednesday, April 16, 2013. Rachel Aston/Xpress. District 3 Supervisor David Chiu, representative of the eastern portion of San Francisco, secured his seat in the California State Assembly winning 51.37 percent of the vote against District 9 Supervisor David Campos. Chiu will leave the board to fulfill his role as the District 17 assemblyman, leaving the city’s District 3 supervisor seat vacant. San Francisco Mayor Ed Lee, who endorsed him last month, will have the power to find someone to fill Chiu’s seat until the 2016 supervisor elections. Incumbent Phil Ting swept the race for California State Assembly District 19 seat, taking more than three-quarters of the vote. His opponent Rene Pineda received 23.25 percent of voter support, while Ting received the remaining 76.75 percent of the vote. District 19 serves the western portion of San Francisco, including SF State and some parts of northern San Mateo County. Ting, who acted as San Francisco Assessor-Recorder, before being elected to represent District 19 in the state assembly in 2012, serves on the Assembly Budget Committee as well as the Budget Subcommittee on Education Finance. Voters threw support behind Prop A, the San Francisco Transportation and Road Improvement Bond, passing with 71.23 percent of votes. The proposition allocates $500 million to finance the construction and enhancement of infrastructure and public transportation services. These transportation improvements will include building new escalators and platforms for the disabled, increasing pedestrian and bicycle safety and efforts to reduce travel time on public transportation, among other things. Prop B, passed with 61.14 percent support, will increase San Francisco Municipal Transportation Agency funding as a reflection on city population. The measure is expected to generate $22 million more in SFMTA’s Base Amount funding in 2015, with an estimated $1.5 million in additional funds every year from the city’s General Fund, according to City Controller Ben Rosenfield. Under the bond, the 2015-16 fiscal year Base Amount would be approximately $256 million, compared to 2014-15’s $247.9 million. San Francisco approval of Prop C, which passed with 73.20 percent of votes, will extend funding for children and family programs like the Children’s Fund and Public Education Enrichment Fund. Both programs provide services such as job training, child care and health services. The proposition also extended their funding for 25 years and 26 years respectively, according to this year’s Voter Information Pamphlet and Sample Ballot. The Children’s Fund will see annual bump to $65.4 million a year. Coordinator for the San Francisco Child Care Planning & Advisory Council Erica Maybaum applauded the measure’s passage and said it was a victory for child care. 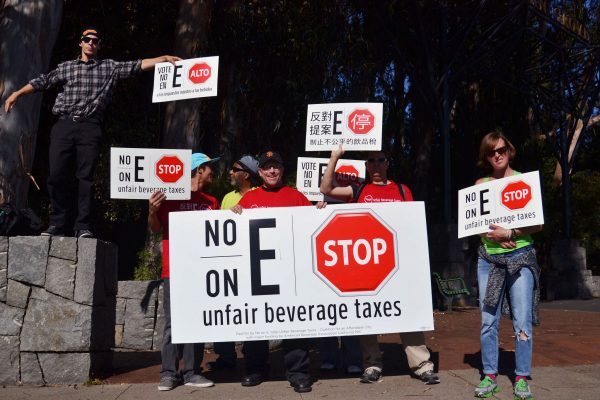 Paid volunteers for the No-on-E campaign hold signs up on the corner of Sloat Boulevard and 19th Avenue, opposing the soda tax being voted on that day Tuesday, Nov. 4, 2014. Helen Tinna/Xpress. Proposition E pulled out a narrow 54.50 percent in favor, but failed to pass a two-cents-per-ounce tax on distributors of select sugar-sweetened beverages in San Francisco as it did not garner a two-thirds vote. The funds collected would have gone toward health, nutrition, physical education and active recreation programs in public schools, parks and other entities in the city. The measure deems a sugar-sweetened beverage as a drink that not only has added sugar, but is 25 calories or more per 12 ounces. Some beverages escape the tax even if there is sugar added Diet sodas, milk, infant formula, drinks that only contain natural fruit and vegetable juice, meal replacements and supplement beverages would not have been affected. San Francisco voters approved by a 76.83 percent margin to instate a gradual increase in the city’s minimum wage to $15 an hour by July 2018, with further increases based on inflation. The ordinance will begin the increases in 2015 at $12.35 per hour. The following year, the minimum wage would increase to $13 per hour, and increasing by $1 for the next two years. The measure applies to private and public workers, and after 2018, annual cost of living wage increases will be implemented in the years to follow according to City Controller Ben Rosenfield. Voters overwhelmingly approved Proposition 1, effectively allocating $7.12 billion in general obligation bonds for water supply infrastructure advancements in the state. The recent drought made the proposition particularly relevant in California, drawing a 76.42 percent vote in favor of the new proposition. Funds totalling $425 million will be reallocated from prior water bond acts for projects pertaining to water storage, supply management, treatment improvements, drinking water protection, ecosystem and watershed protection, water recycling and flood control. The legislative analyst estimates the state bond repayment will increase to $360 million per year for the next 40 years, paid for by general tax revenues. Local governments are predicted to save an average of $200 million per year over the next few decades. Voters approved the Public Notice Required for Insurance Company Rates Initiative, or California Proposition 45, which requires the state insurance commissioner approve changes in rates for individual and small group health insurance companies. The proposition garnered a 60.07 percent of favorable votes. The proposition ensures that any changes made to health insurance rates are first approved by the California Insurance Commissioner and such changes will be disclosed to the public. The health insurances companies the initiative applies to will be sanctioned the way car and homeowner insurance companies are. The California insurance commissioner now has authority to halt excessive rate increases, require insurance companies to justify rate increases to the public, and ensure fair pricing for insurance consumers. Californians rejected Proposition 46, or the Medical Malpractice Lawsuits Cap and Drug Testing of Doctors Initiative. It received 65.23 percent of voters who rejected the proposition. If passed, it would have been the first law in the US to necessitate random drug testing of medical practitioners. The initiative proposed to raise the cap on medical negligence lawsuits to over $1 million. The original cap was set to $250,000 in 1975 and has never been adjusted for inflation. Proposition supporters hoped the initiative would pass to assure fair compensation for victims of medical malpractice. Californians voted to pass Proposition 47 by a landslide 79 percent vote, which pushes the classification on some non-violent crimes down from felonies to misdemeanors. The offenses impacted include shoplifting, grand theft, fraud, forgery, writing bad checks, and receiving stolen property– all up to a specified monetary amount. The proposition reduces the sentence for personal use of most drugs and allows resentencing for prisoners serving sentences for the reclassified offenses. The initiative also creates a Safe Neighborhood and Schools Fund.